Ryobi is a Japanese manufacturer proudly boasting an extensive line of power tools, building hardware and printing equipment. It also sells components for electronics, telecommunications and the automotive industry. Ryobi first started in 1943 under the name of Ryobi Seisakusho Co. Ltd. and began producing power tools in 1968. By 1973 the company had changed its name to ‘Ryobi’ and began manufacturing several makes and models of power tools. It is now owned by Techtronic Industries, with its head office based in Hong Kong, China. You can find Ryobi in North America, Australia, New Zealand and Europe. Ryobi currently has 12 gas powered, electric powered, battery powered and pole chainsaws on the market. Their largest line is battery powered, which is targeted towards those ‘DIYers’ and homeowners, rather than professionals or commercial grade. Their many battery powered makes and models for sale are popular due to their ‘one battery fits all’ approach. This means many of their power tools can have their batteries interchanged. All models carry the same distinctive green and black coloring, representative of their brand. Their models are loved and trusted throughout the world, and they have certainly found their place as a leading chainsaw manufacturer on the market. It has an anti-vibration handle for reducing user fatigue. It has an adjustable oiler. It has many safety features. It has a powerful engine, perfect for many jobs around the home. Some of the ‘out of the factory’ settings need adjusted before use. The chain can get clogged up with debris easily. The self-oiler may need adjustment. Dimensions: 28 x 12 x 12 inches (package dimensions). QWhat is its fuel tank capacity? QWhat type of engine is it? QWhat fuel does it use? As loyal as an overexcited dog, the Ryobi 14 inch gas powered saw packs a punch when it comes to power. In comparison to other brands with similar specs, you receive a lot of reliability and power for the cost. Not only does it cut through various log sizes with ease, but when maintained, this gas powered saw will start easily every time. It’s one of the best Ryobi chainsaws for the money on the market today. It has a long life battery. It is a great domestic saw in terms of power and reliability. It has push button start. It has a small target market of homeowners. It’s limited in its reach by the battery life. For the homeowner who requires reliability, a long lasting battery and plenty of power, this Ryobi battery powered chainsaw is the answer. It’s clean, easy to use, lightweight and does everything it should. It’s priced right for homeowners and has gained a reputation for being a saw that gets the job done. This is the best Ryobi chainsaw for the money as what it lacks in being gas powered, it makes up for in reliability and user convenience. It’s easily one of the best deals around. Check out what other people who purchased this product think about it. Read Ryobi P547 cordless electric chainsaw reviews. It has an anti-vibration feature to reduce user fatigue. It has an adjustable oiler to increase the lifespan. It’s a very powerful homeowner saw. It’s only suitable for domestic cutting. The instruction manual isn’t detailed enough for first time chainsaw users. It can be difficult to start from cold. QHow large in diameter can it cut? If you’re looking for a top rated, reliable gas powered saw which is worth its weight in gold, the Ryobi 16 inch chainsaw is for you. It’s perfect for domestic cutting, has top of the line features for user convenience, and is very easy to maintain. It’s lightweight to reduce user fatigue, and for the cost, it offers all those high spec features you expect on a saw much more expensive. 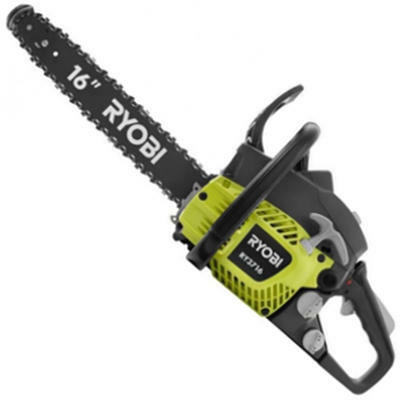 Overall, it’s an affordable chainsaw and is one of the best Ryobi chainsaws for the money. Check out what other people who purchased this product think about it. 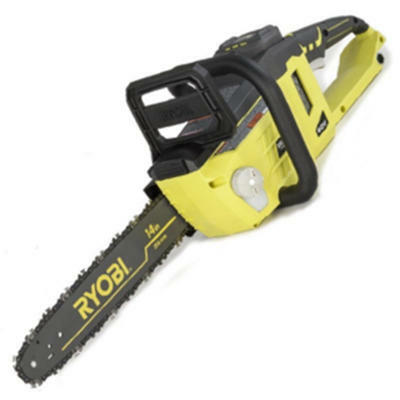 Read Ryobi RY3716 gas chainsaw reviews. The battery is interchangeable with all Ryobi 40V Lithium-ion tools. It’s very affordable to a wide range of users. It’s very easy to maintain and doesn’t require fuel. It’s powerful in comparison to its petrol powered counterparts. The chain is easy to dull. The battery life is not as good as other models. You are limited in where you can use it because of the need to charge batteries. Warranty: 3 year or extended 5 year warranty. QDoes it have an auto oiler? QCan you buy heavy duty batteries and chargers for it? For light domestic cutting duties, this Ryobi electric saw fits the bill. It’s affordable, cost-effective to run and maintenance is as simple as keeping the chain lube topped up and the chain sharpened. It’s the perfect saw for homeowners who don’t want the hassle of maintaining a gas saw for small cutting jobs. Its battery life with the standard battery is not great, but you can buy heavy duty batteries to increase that life. Check out what other people who purchased this product think about it. Read Ryobi RY40511 cordless electric chainsaw reviews. It has a powerful 6 amp motor. It’s a great pruning saw with an 8 inch kerf bar and chain for quick and easy pruning. It extends up to 9 feet – it has great reach. The chain is known to fall off. The cord limits its reach. It needs a heavy duty extension cord to allow you more flexibility in location. Ryobi electric powered pole chainsaw. 8 inch kerf bar and chain. QHow far does it reach? QHow many amps is the motor? QWhat kind of extension cord can be used? QCan it be used as a hand saw? 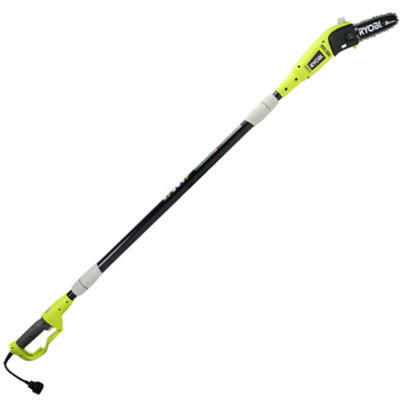 This corded electric powered pole saw has all your pruning needs met. From the 8 inch kerf bar and chain for quick pruning, to the angled cutting head which gives you better control; there’s little more you could need. Check out what other people who purchased this product think about it. Read Ryobi RY43160 electric pole chainsaw reviews. The manufacturer Ryobi is owned by Techtronic Industries, based in Hong Kong. Techtronic Industries is the original manufacturer for cost effective brands such as ‘Craftsman’ and ‘Ridgid’ as well. 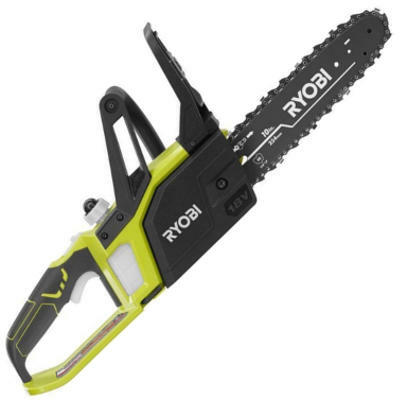 Where are Ryobi chainsaws made? 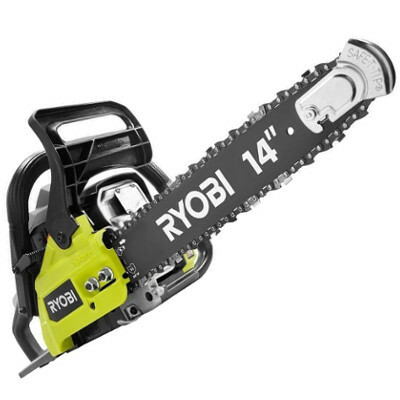 Where do you buy Ryobi chainsaws? In the US and Canada you can buy Ryobi products through Home Depot and online on websites such as Amazon. In Australia and New Zealand many models are available at Bunnings Warehouse, and in the UK, they are for sale at leading hardware stores.